12. Dont Believe Em Feat. Akon & T.I. Universal Motown has announced the signing of Busta Rhymes to its label. As one of hip-hop's most enduring iconic figures, Busta Rhymes is acknowledged among rap's greatest lyricists and performers as a hip–hop icon. 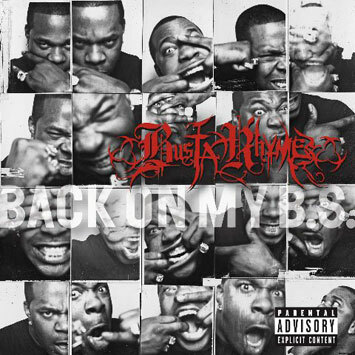 Busta Rhymes' first album release on Universal Motown Back On My B S is scheduled for release on December 9th. "I am thrilled to reunite with Busta and welcome him to the Universal Motown family" said Universal Motown President Sylvia Rhone. "It's a rare and wonderful opportunity to be able to sign an artist who is at once a musical icon while remaining completely forward–thinking. Busta is a true original and one of modern culture's most gifted voices and charismatic characters. His role in hip–hop history is enormous, and his new music ranks among the best work of his career. We had a great multi–platinum run together in the '90s, and I can't wait to do it again." Since 1991 Busta Rhymes has been greeted as a transformational, bar–raising iconoclastic performer and writer. Not only was he a member of the four–man group Leaders of the New School, but also as a member of 'Native Tongue Brothers' which consisted of Tribe Called Quest, Leaders Of The New School, Black Sheep, De La Soul and Jungle Brothers. That same year Leaders Of The New School teamed up with A Tribe Called Quest to create the all–time classic single "Scenario," and released A Future Without a Past on Elektra Records. In 1996 Busta Rhymes released his debut solo album, The Coming, which featured the hit song "Woo Hah! Got You All In Check." The single marked his first of 14 RIAA gold and platinum certifications in his association with Elektra as a solo artist and founder of Flipmode Squad, and an additional five through J Records and Aftermath/Interscope. His 2006 album, The Big Bang, debuted at No. 1 on the Billboard Top 200 album chart. Busta Rhymes' run in the international pop, rap and urban top ten has extended over a decade, from the platinum Grammy–nominated single "Woo–Hah!! Got You All in Check" through the No. 1 Hip–Hop/R&B and No. 3 pop "What's it Gonna Be?!" featuring Janet Jackson and "Pass the Courvoisier" with Diddy and Pharrell, and into the digital era with the gold–certified mastertone "Touch It." In between making albums, Busta entered the acting arena starring in John Singleton's hit movie Higher Learning (1995) in which Busta made his acting debut. Busta teamed up again with John Singleton and starred along side Samuel L Jackson, Vanessa Jackson and Christian Bale in the remake of the 1971 classic Shaft (2000). Also in 2000 Busta Rhymes starred with Sir Sean Connery in Finding Forrester, and in 2002 he starred with the 'Queen Of Horror Movies' Jamie Lee Curtis in Halloween Resurrection. As Busta Rhymes embarks on his eighth studio album Back On My B S on December 9th and his first release through Universal Motown Records, Busta will once again prove that he is a formidable centerpiece in music. As an iconic figure, Busta has demonstrated to be viable and respectable mainstay amongst both diverse group peers and elaborate fan–base. His undeniable talent coupled with upcoming partnerships, demonstrate Busta Rhymes is a living legend.